Image: Prof. Michael Useem takes a group of EMBA East students on a trip to Gettysburg to learn leadership lessons. 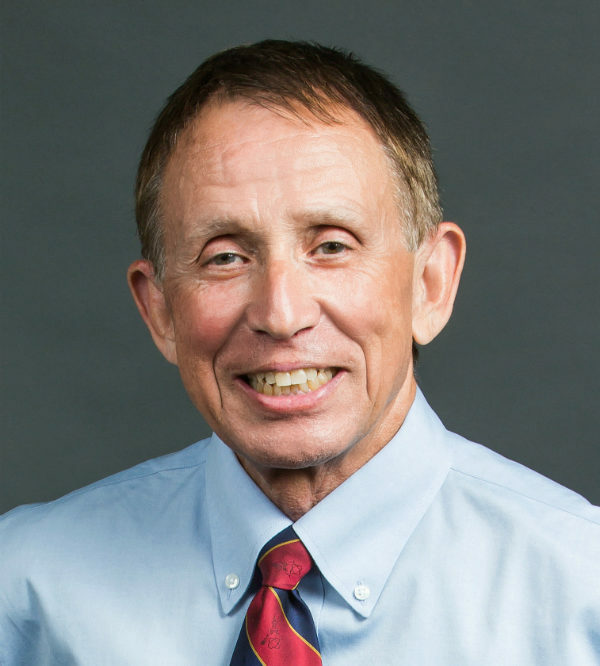 From Leadership Ventures to a weekly radio show, Prof. Michael Useem wants to help everyone improve their leadership skills. Wharton Prof. Michael Useem leads students in the MBA Program for Executives on a Leadership Venture annually to Gettysburg National Military Park. The one-day optional program takes them on a tour of the U.S. Civil War battlefield where they learn about decision making, strategy, and leadership through the eyes and experiences of the Union and Confederate commanders who engaged there. “Our Venture puts students in a place where the concepts from our leadership class become that much more indelible,” he explained. Prof. Useem is faculty director of Wharton’s Center for Leadership and Change Management and McNulty Leadership Program, editor of the Wharton Leadership Digest, co-host of Leadership in Action on Wharton Business Radio, and the author of several books about leadership. We talked with Prof. Useem about his class, Leadership Ventures, and current research projects. 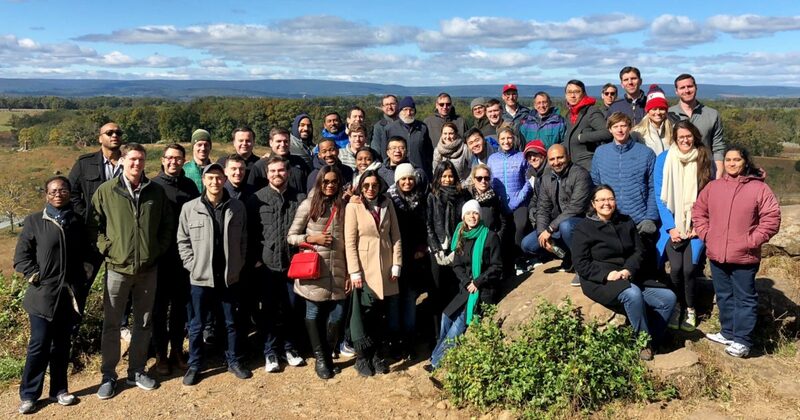 Wharton Executive MBA East students stand on the Gettysburg battlefield on October 21, 2018, as part of a Leadership Venture led by Prof. Mike Useem. Why did you choose Gettysburg as the location of a Leadership Venture? The Civil War battle at Gettysburg on July 1-3, 1863 could have gone either way. Much of the outcome – the Union ultimately prevailed – came down to the leadership decisions that the army commanders made during the deadly engagement that resulted in more than 50,000 casualties. We stop during our battlefield visit at several key points that provide for detailed discussion and reflection on the engagement’s historic actions. At one of those venues, for instance, we reflect on how a Union commander, Joshua Lawrence Chamberlain, creatively devised and then decisively executed a successful defense of the Union line against a forceful Confederate attack. We stand where Chamberlain stood to help us recreate and better appreciate that moment when his resistance made an enormous difference in the battle’s outcome. We seek to make that instant as graphic as possible and then ask participants to reflect on how this commander had acted in ways that might help them address moments of decision in their own workplace. We do the same at several other decisive locations on the battlefield, and we conclude with a visit to the venue where President Abraham Lincoln delivered his famous Gettysburg Address during the dedication of a national cemetery after the battle. The speech numbered fewer than 300 words, but they were extremely well-turned for advancing the president’s long-term agenda for reunifying the country. We are here reminded how important it is for leaders to think not just about the present day, but also the distant future – and to make a persuasive case for building it. What are some of the lessons that you want students to take from this Venture? We focus on how to build confident and credible leadership throughout the ranks before it is needed – for whatever challenges lie ahead. In the case of both the Union and Confederate armies at Gettysburg, we identify instances when their mid-level leadership – or its absence – proved decisive on the battlefield. Here we are reminded of the importance for the business world of mentoring managers one or two levels below you to ensure that you have the bench strength for the challenges that lie ahead. We also review examples in both armies at Gettysburg of the power of a commander’s reputation for leadership in moving others into action. Whatever the formal powers of the office, a commander’s ability to inspire troops during the battle was significantly enhanced by an aura of respect and authority. We ask how those who led on both sides at Gettysburg acquired that reputation, and here we identify a range of actions that are as important today as they were at the time of the battle, including the articulation of a compelling vision, confidence in oneself and others, and the communication of high- performance expectations. What other Leadership Ventures can EMBA students participate in? Several of our Ventures are open to all MBA students, including one with the U.S. Marine Corps and a second with the Fire Department of New York. Others are designed just for executive MBA students, including our Gettysburg visit and a venture in Alaska. How did the Leadership Ventures begin? The Ventures came out of my personal experience in offering an EMBA course on leadership. A student pointed out that while classroom learning is good for thinking through theories of leadership and for dissecting dilemmas in leadership, we could do more to drive home the enduring principles of leadership in ways that makes them more memorable and more readily applicable when students are back at work. That’s why I first began taking executive MBA students to Gettysburg, and since then the Wharton Leadership Center and McNulty Leadership Program have added a host of other hands-on learning experiences for MBA, executive MBA, and undergraduate students across a broad range of venues. What class do you teach in the EMBA program? What do you want students to learn from that class? I offer a core first-year course on both coasts that is an introduction to leadership and teamwork. Many students come to this program with extensive work experience, and they express a high need to learn more about the exercise of leadership since they have moved well up their firms’ ladders and have increasingly taken personal responsibility for groups, operations, and sometimes the entire enterprise. I work to bring in research, experiences, and cases that help them strengthen their personal and team leadership capacities, including an ability to think strategically, communicate persuasively, and act decisively. Since our EMBA students arrive with extensive work experience and have personally experienced many of the challenges in leading others, there is a very high level of classroom engagement. Also, with a decade or more of work, students come with a wonderful repertoire of leadership moments and personal experiences, making for richly informed classroom discussions. One of my personal goals has long been to help others in developing their leadership, and it has thus been a privilege to be part of this program. What is your motivation for hosting a weekly radio show on leadership? I cohost Leadership in Action on SiriusXM Wharton Business radio, channel 132, with my colleagues Anne Greenhalgh and Jeff Klein to help leadership ideas and methods reach an even broader audience. Our weekly show seeks to help listeners learn more about tangible practices and enduring principles for strengthening their own leadership. We hear directly from other leaders about what they are thinking when they lead, and what happens in and around their office when it comes to their most consequential decisions. What research projects are you working on these days? I recently finished a book with a colleague on enterprise risk management, focusing on what companies are doing to prepare themselves against low-probability but high-consequence setbacks, whether from natural disasters or management-induced calamities. I have also completed a book with three others on how company executives and directors can think more long-term, and I am now working on what’s new and emerging in enterprise leadership, how innovations and disruptions are changing what is required to grow and lead an enterprise. Click here to read about a radio interview with Prof. Useem and Wharton EMBA alumnus Roger Crandall, chairman, CEO and president of MassMutual.